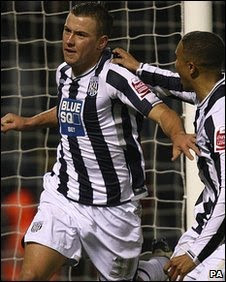 Simon Cox scored an equaliser deep into injury time to salvage a deserved draw for West Brom against QPR. The visitors, with Steve Gallen and Marc Bircham in charge, went ahead when Jonas Olsson's attempted clearing header looped into his own net. Kaspars Gorkss doubled the lead with a simple header after a mistake by Dean Kiely but Jerome Thomas pulled one back with a swivelling shot. And Cox snatched a point when he tapped in a rebound in the 94th minute. The result will be hard to take for Rangers' novice managerial duo, who took charge with Jim Magilton suspended following his alleged altercation with Akos Busaky after the defeat against Watford. West Brom, meanwhile, may have missed the chance to make up genuine ground at the top of the table but manager Roberto Di Matteo will be relieved to have taken anything from a game they seemed destined to lose. "The way the game went a point is better than nothing. I'm trying to look at the positive side of it. "The players fought really hard for the point. I thought we deserved a little bit more as well, we had some very good chances but didn't quite manage to score. "We've definitely been leaking too many goals in the last three games." "I don't know what is going to happen. I just got told last week and it feels like the longest week ever. "I don't know if I'm charge for Saturday's game (at home to Sheffield United). "I don't know when I'll find out. I saw something yesterday and it said the club are meeting with Jim and something will be decided over the next 48 hours. "I welcome that, definitely. I'm sure people on the outside at QPR want to see things resolved quickly - we all do on the inside. "I also saw some things during the week about chaos at QPR - that's absolute nonsense. I've not seen any chaos at the training ground."